While traditional in design, the Frenchie king bed is forward-thinking in substance. This classic Louis Philippe sleigh style with panel details and practical bracket feet gets an eco-friendly update when handmade with mahogany reclaimed from old mills, homes and warehouses. It’s then finished using a special 17-step process that includes sanding, rubbing and staining by hand to create a rich patina that intensifies the unique beauty of the wood. 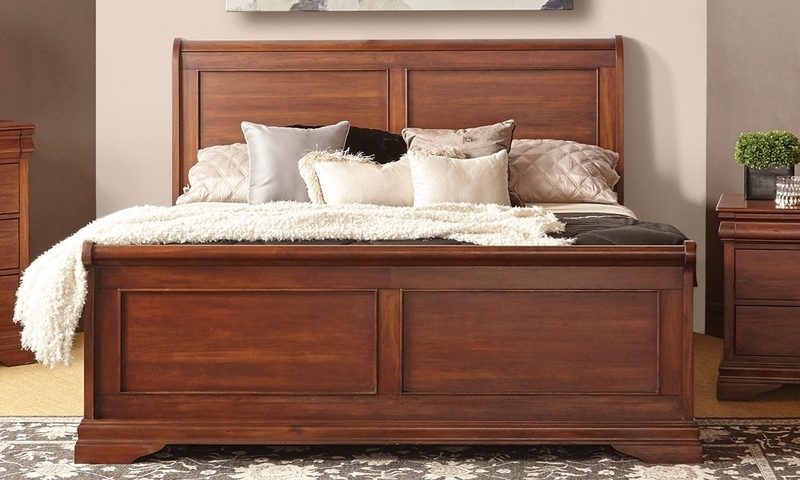 Louis Philippe-style queen sleigh bed crafted from sustainably sourced mahogany and finished by hand to showcase the natural wood grain. 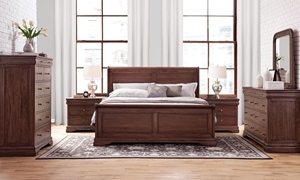 Classic Louis Philippe-style bedroom includes queen sleigh bed, 8-drawer dresser and mirror handcrafted from reclaimed mahogany.